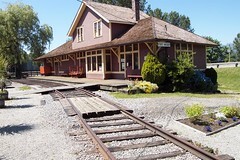 Become a part of the society that runs the Port Moody Station Museum with a 2009 Port Moody Heritage Society Membership. The Port Moody Heritage Society welcomes new members to become a part of it. Your membership helps support the operation of the museum and other projects of the society. You also have a say at the Annual General Meeting in the Spring of each year and with the election of the Board of Directors and Executive. Membership numbers influence grant money coming into the museum as well and provide a large part of our budget for maintaining and displaying the collection. Memberships start at $5 Canadian for family or individuals. Heritage Society Memberships make a nice gift. Consider gift memberships for 2009! Memberships are now more affordable than ever! Support the Museum and buy one for yourself! Buy one for each member of the family! Support the Museum With a Membership! Or give a membership as a gift. Become a part of the society that runs the Port Moody Station Museum. The Port Moody Heritage Society welcomes new members to become a part of it. Your membership helps support the operation of the museum and other projects of the society. You also can have a say at the Annual General Meeting in the Spring of each year and the election of the Board of Directors and Executive. Membership numbers influence grant money coming into the museum as well which provide a large part of our budget for maintaining and displaying the collection. Memberships start at $5 Canadian for family or individuals. Consider giving a Gift Membership. We are also always seeking volunteers in many different areas. Please contact the museum for details! The New Year is approaching swiftly and Heritage Society Memberships make a nice gift. Buy gift memberships for the coming year! Memberships are now more affordable than ever! Support the Museum and buy one for yourself! Buy one for each member of the family! Memberships now more affordable than ever! Support the Museum and buy one for yourself! Buy one for each member of the family! Buy one as a gift!